AB 31 to AB 38, AB 40 to AB 56, IV 1 to 28, IV 30 to 32, IV 36 & 40, IV 52 to 54, IV63, KW 1 to 14, PA 21 to PA 38, PH 4 to PH 41, PH 49, PH 50. Northern Ireland (BT) HS, IV 41 to 49, IV 51, 55 & 56. Custom Printed Personalised Balloons;. i.e White Ink on Black Balloons & Black Ink on White Balloons. Suitable for Helium or Air Fill. Quality Latex Balloons. Specify the Date you Require the balloons. Personalised Custom Balloon Printing Balloons : We only use Quality Belbal Latex Balloons. All Balloons Are Printed Neck Down., This is the correct way for using with Balloon Gas or Balloons Cup & sticks.Unless you specify. Balloons : We only use Quality Belbal Latex Balloons. All Balloons Are Printed Neck Down., This is the correct way for using with Balloon Gas or Balloons Cup & sticks.Unless you specify. AB 31 to AB 38, AB 40 to AB 56, IV 1 to 28, IV 30 to 32, IV 36 & 40, IV 52 to 54, IV63, KW 1 to 14, PA 21 to PA 38, PH 4 to PH 41, PH 49, PH 50. Disney CARS McQueen Storm Happy Birthday 18" Round Foil HELIUM BALLOON Party. Condition is New. Dispatched with Royal Mail 1st Class Large Letter. 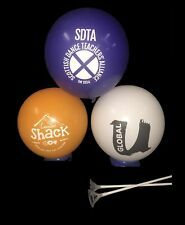 Can be inflated using helium (not supplied) or air tube provided. 20 Custom Printed Personalised 12" Balloons.Toys R Us. Condition is New. Dispatched with Royal Mail 1st Class. Personalised Custom Balloon Printing Neck Down., This is the correct way for using with Balloon Gas or Balloons Cup & sticks.Unless you specify. · Balloon Colours : Single or Assorted Colours. Balloon Valves. Long lasting, can be refilled.